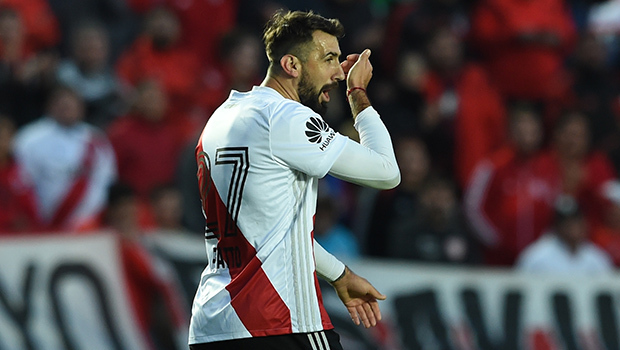 "I will never forget the final match against Boca"
"I will never forget the final match against Boca" Lucas Pratto spoke exclusively with the Official Site and commented about these first months in the Club, and among other things, about obtaining the Argentine Supercopa against River’s top rival. The heat of the sun eclipses the morning cold in River Camp, where the professional team works on the finishing preparations for what’s coming up next: the following commitment for the Argentine Cup, the game against Racing for the round of 16 of the Libertadores Cup and the debut at the Superliga against Huracán. There, Lucas Pratto and his companions perform an intense and demanding training. He listens and practices the tactical orders Gallardo gives him with maximum attention, understanding that the sacrifices and efforts, will be really beneficial for all the important matches that are yet to come. The center-forward said, that Gallardo was key for his arrival, as he was seduced by the possibility of being coached by him. More than seven months have passed since he joined the team, so now he takes stock of the experience he is having with the coach: "I was surprised by the leadership skills he has, which until now in my career had only seen in “El Flaco” Gareca. He really knows what he wants and needs, both from the entire team as well as each and one of us. And that, is strongly reflected on the pitch. He also has a spectacular team management skill, and other two things that are fundamental to me: The group is above everything, and only the best player is the one who gets to go out on the field. There are no privileges. That is the best thing that can happen to a player and, as a consequence, to the team. You always have to give the most of you in each training session. We know we have to ready for the moment we are picked to play". Gallardo is a coach who is constantly innovating. Can you say that now we are going to see a new River? Yes, you can say so. I think that Gallardo's teams always had a game identity, based on the constant pressure, intensity and good treatment of the ball. This things made the team thrive in great moments and also gave River the opportunity to win as much as it did. So now, we seek for the same characteristics. In this pre-season we placed a lot of emphasis on having a constant rhythm and not letting the rival breathe. We already tried it in friendly matches. The pre-season was intense, that's why we are going gradually, and the idea is to increase it along the running of the matches. Being together for a few months really favored us, because the same base is maintained but now we already know each other, also we finished the previous semester with a very good soccer level. The idea now is to achieve the best performance we can. At first, when you arrived you said that you liked better playing as center forward, but now you are doing both functions: scoring goals and also pulling back to make spaces and assistances. Now we play with two strikers, which I had not done in a long time. And this gives me, and the other central forward freedom to play loose and move around the attack front. Because when one of us is in the area, the other is either thrown back, or can appear on the sides. So, you're doing a duo with Scocco? You always said you'd love to play with him because he's a striker who handles all the variations. We have high hierarchy strikers, such as Mora and Borré, who demonstrate their quality each time they set foot in the court. Yes, I’m playing a lot with Nacho, and we've been doing it since the previous semester, we really understand each other. By taking the mark, he creates spaces which allow me, playing on a more forward position a better chance to score. He is a high class category forward, who knows everything; How to Play out of the area, across the attack front and appear in the definition zone, and as a result, make goals. I do almost the same. Gallardo also expects the players to go and help in the recovery of the ball, when is not in our possession. It’s very important to play and mark when necessary, in order for the team to be closer to the opponent's goal and in an offensive position. In addition to the duo you do with Scocco, there is also the triangulation you both form with Pity Martinez. Gallardo asks us to do that, to triangle. And with “El Pity” we have been doing it since the preseason. And we will keep improving with the running of time. He is playing behind us, in a more middle position, and that comes really handy, because you know that you can get an assistance at any time or an already built goal play. He has the speed and skill needed to get rid of the mark. And he is going through a great moment, really helping the team performance. To keep working on the performance and collective understanding, on Saturday the team has an opportunity against Villa Dálmine for the Copa Argentina. This presents as a test to keep growing and improving in order to face the commitments that are yet to come. It will not be an easy match. Villa Dálmine is playing well, and did a very good championship in the National B, they also have a coach who is very intelligent when it comes to match strategy. Being champion with River against Boca must have left a mark you. It was very special for me. The same as for Armani, Juanfer Quintero and Bruno Zuculini, with whom were the last to join the team. We knew that the final was leaving a mark on us from that day on. Winning against Boca, the eternal rival. And the way we did it, with clarity, authority and forcefulness. I will never forget it, because in that moment I understood why this team wins as much as it does, and really appreciate the magnitude of River as a Club. It exceeded the expectations I had. Speaking of winning. The crossing against Racing is coming for the “Copa Libertadores”. Do you feel confident? We know it's difficult, but we want to win it, and I think we have the skills to do so. We are a team with a high hierarchy, and in this type of games, that feature is powered. We know how to handle them. In addition to our football abilities, we have the mettle that must be shown in this kind of competition. It will be a nice encounter, because both Racing and River encourage good football and love being always protagonists.